Sorry, folks. 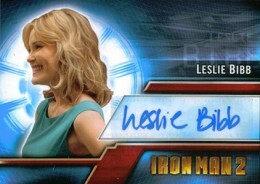 Gwyneth Paltrow does not have an autographed Iron Man trading card. Now that that's out of the way, let's look at what you can collect from the massive super hero franchise. Take all three films combined and the list is extremely impressive. 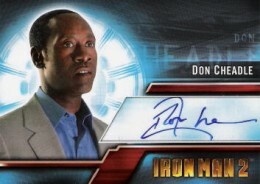 From Hollywood A-listers to some lesser stars to The Dude, Rittenhouse and Upper Deck have given collectors some impressive Iron Man autographs to chase. 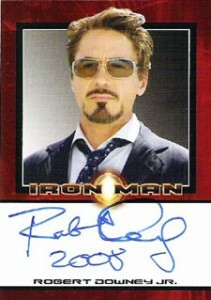 Shop for Iron Man autographs on eBay. 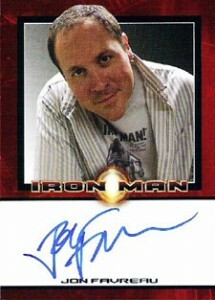 When Iron Man launched in 2008, Rittenhouse covered it in the hobby. 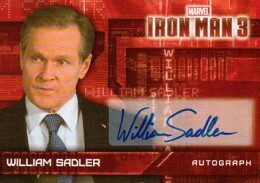 Autographs were grouped with costume cards and sketch cards to fall two total per box. As a result, autographs weren't that common. But for those lucky enough to hit the lead stars, it was worth it. Leading the way was Robert Downey Jr, one of the greats of his generation, who signed as Tony Stark. For completists, the card can be found with an without an inscription noting the year "2008." 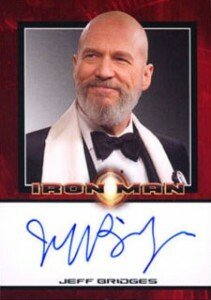 Also in the set is Jeff Bridges, a legitimate Hollywood legend and Academy Award nominee. 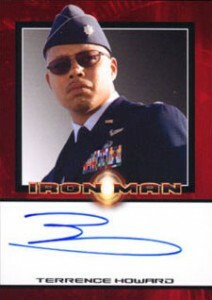 Both the Downey and Bridges Iron Man autographs are deemed "very limited" by Rittenhouse, which means there are 200 to 300 copies of each. 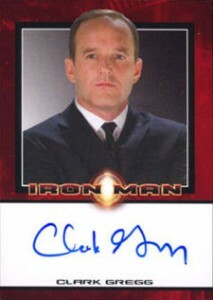 Other 2008 Rittenhouse Iron Man Autographs include director Jon Favreau, Academy Award nominee Terrence Howard and Clark Gregg as Agent Coulson. 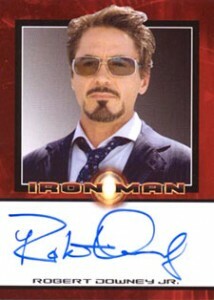 Some time later, Rittenhouse sold a second Robert Downey Jr. autograph direct to customers and dealers. 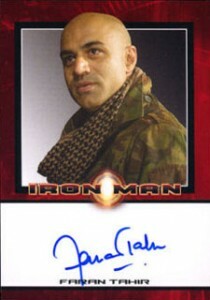 This variant features an image of Downey dressed as Iron Man. It cannot be found in any packs. 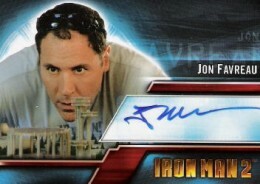 Upper Deck went ahead with an Iron Man 2 trading card set in 2010. Again, autographs were not guaranteed on a per box basis. In fact, they were even tougher, falling 1:96 hobby packs (1:4 boxes). Downey didn't sign this time around and the checklist is noticeably smaller, but there are still a pair of Academy Award nominees in Mickey Rourke and Don Cheadle. 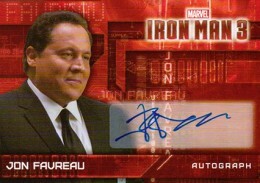 Also signing are Favreau and Leslie Bibb. 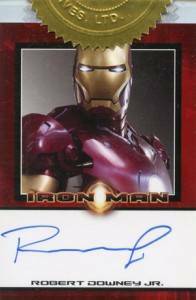 2013 Upper Deck Iron Man 3 has more autographs, but the trend towards more rare signatures continues. Found 1:144 packs, there six different Actor Autograph cards from four different signers. 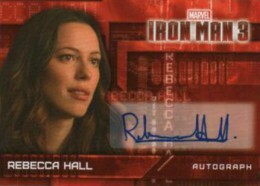 Rebecca Hall is the most popular on the secondary market. 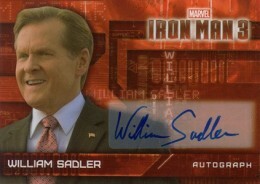 Other signers include two different Jon Favreau cards, two William Sadler cards and one from director Shane Black. 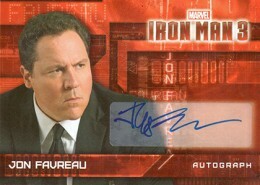 Hall and Favreau also have autographed costume cards. 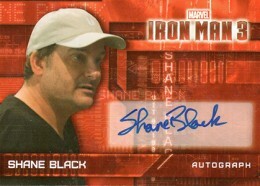 Upper Deck also included several comic autographs in the set, although they're inserted as their own separate set. 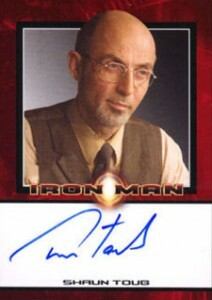 Below is a complete visual guide to all Iron Man movie autographs found on trading cards. You can also shop for singles on eBay by clicking on the actors' name. Available with and without a dated inscription. This card is not in packs. Rittenhouse sold it separately. Basic autographs inserted 1:144 packs. 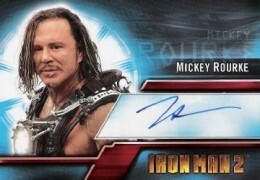 Odds not announced for autographed costume cards.